Allen Bjorkman demonstrates how a Gutenberg-era printing press works. 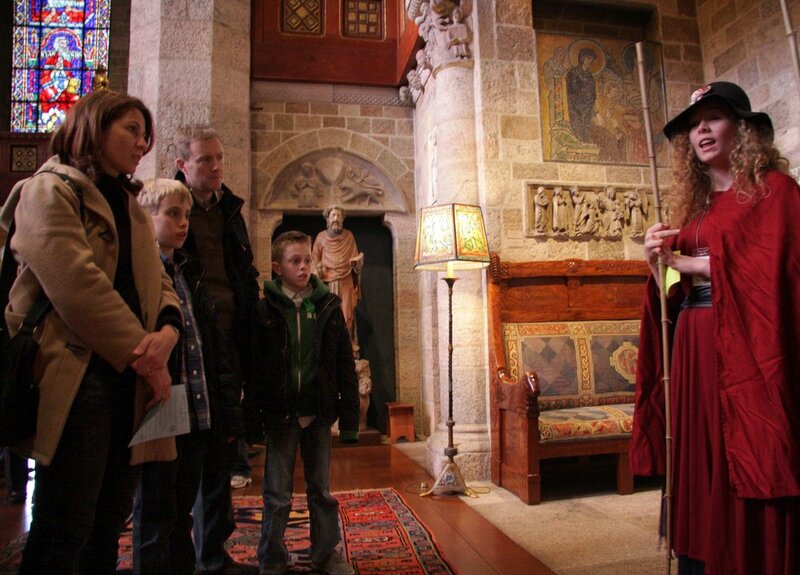 Kirsten Gyllenhaal shows visitors a page she just printed on Glencairn's replica Gutenberg-style printing press. A Bryn Athyn College student begins the guided Pilgrimage tour. The Vendor (a Bryn Athyn College student and Glencairn Intern) at her stall "sells" pilgrims the supplies they will need for their pilgrimage journey. Sarah Dressler shows visitors how manuscripts were illuminated in the Middle Ages. Sarah Dressler illuminates a manuscript. Susan Kelly vonMedicus shows visitors colors used in illuminated manuscripts. 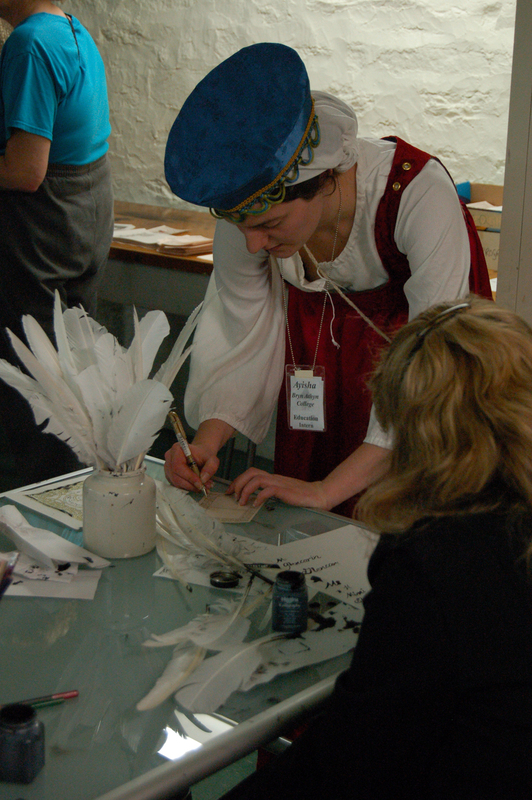 A volunteer helps a visitor try her hand at writing with a quill pen. 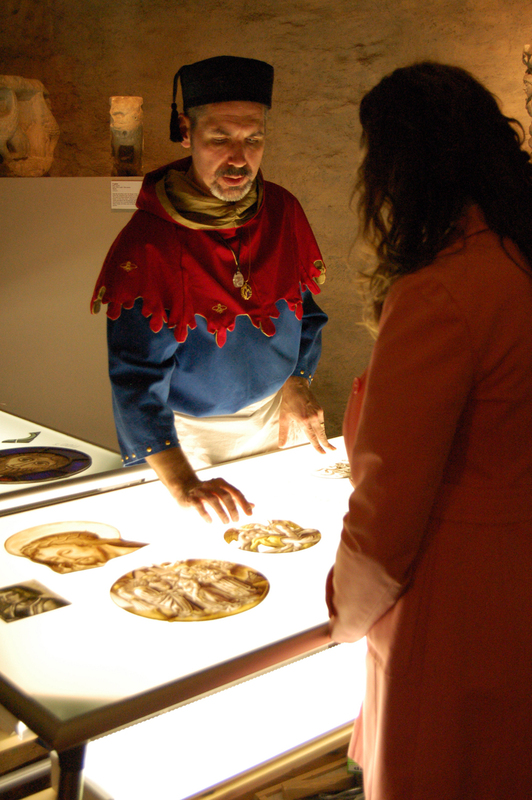 Stained glass artist J. Kenneth Leap talks with a visitor about the art of medieval stained glass painting and window making. Stained glass artist J. Kenneth Leap and Bryn Athyn College students talk with visitors about stained glass painting and design. Paul Butler of New Jersey plays medieval music on replica medieval instruments. Paul Butler plays a hurdy-gurdy for visitors in the Great Hall. Eva Mergen demonstrates medieval weaving on a scale miniature loom. Eva Mergen demonstrates wool working. Two knights demonstrate their skills for onlookers. Medieval Festival-goers relax in the Castle Cafe, located near the temporary exhibition.